A New Yorker escapes the city and discovers her own power and determination in Conditioning Hiking Series. "I am strong, I am tough. I am a CHS alum." I moved to Seattle in the summer of 2016 because I no longer really knew who I was, or what I was doing with my life, but I knew that I couldn’t continue living in New York City, with its crowds and smells and weird roommate situations. I had visited Seattle twice before I moved here, and while I didn’t know a lot about the city, I knew that the proximity to the water and the mountains and the boundless natural beauty made me feel better, and I wanted to feel better. So I moved. In pursuit of that natural beauty (and because I didn’t have a car) I looked up organizations that could help me get outside, and I found The Mountaineers. My first Mountaineers hike was the Dungeness Spit, in October 2016. On the car ride there, I met “Summit Shari”. 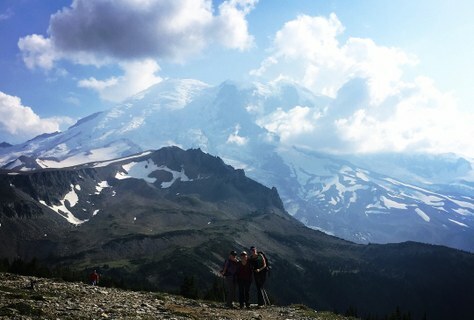 She talked about her experience summiting Rainier, and was incredibly friendly, welcoming, and encouraging about my goals to become more active. She even gave me my first backpack - the one she used to summit. On the hike, I met Shannon. We were both in our early 30s and single and newish to the city, and it was so amazing to meet someone who felt the same way that I did, both about the state of our lives and about our excitement for exploring the PNW. Shannon encouraged me to sign up for the Conditioning Hiking Series. Initially, it sounded really intimidating - I couldn’t imagine hiking 10 miles in a day, let alone the 20-25 required for the graduation hikes. In the past five years, I hadn’t done any “hikes” longer than maybe 6 miles. But I had had such a great time on the Dungeness Spit hike that I decided to sign up. Orientation that first year was a little intimidating. There was a lot of discussion about how to condition between hikes, how to filter water, what food you should eat, what gear you need, what you should wear. Growing up on the East Coast, I had always worn cotton t-shirts and shorts to go hiking, which I learned was the exact opposite of what I should do. I left feeling unsure if I’d be able to cut it in the program, but wanted to try. My first few hikes that year in CHS were definitely challenging. Getting up at 5am to go hiking was … early. Eating only a Clif bar for lunch and some trail mix was … absolutely not enough food. Peeing in the woods while female required strategy and slope considerations. Bug spray can be both critical and utterly useless. But I learned. With every single hike over the past two years in CHS, I have learned. I have learned how to wear gaiters properly (velcro faces front), what kind of microspikes to buy (Kahtoola), and that my 11th Essential is a Theo’s chocolate bar (shoutout to Andy Zavada!). I learned that your attitude and mental strength, and not your thigh muscles, are really what carries up you the mountain. And through my conversations with fellow hikers, I learned more about this region and about the world. I learned where to find highly authentic vegan Indian food (Crossroads Mall, in Bellevue) and that the Methow Valley is a great spot for cross-country skiing (and equally important: wine). I’ve received career advice, doctor recommendations, and the literal shirt off of someone’s back when I needed a clothing change. I've met doctors, nurses, bus drivers, social workers, teachers, engineers, airplane interior designers. People from India, Taiwan, England, Chicago, and Bellingham. People with so many different backgrounds and life experiences, but who are united through a common bond of loving the outdoors and the desire to push beyond what we think we know about ourselves, together. So it’s no surprise to me that, through CHS, I’ve met some of my best friends in Seattle: women who are brilliant, kind, and, through their actions, always inspire me to be a better person -- like how Ashley came back over a dangerous river crossing in Mt. Rainier National Park to help me because I didn’t think I could do it alone; or when Jess let me borrow her car for a weekend, no questions asked; or when Shannon was there to listen when I needed to talk about a tough breakup. Through CHS, I’ve rediscovered who I am. I am a person who can hike 22 miles, 5’000 gain, and still be alive afterward - in fact, even more alive than before! I am a person who can hike 96 miles through Scotland by myself. I am a person who recharges by getting outside. I am a person who can efficiently pee in the woods. I am strong, I am tough, I am alive, I am here. And I am and always will be a CHS alum. CHS is designed to prepare seasoned hikers currently experienced at the upper easy/moderate level for the challenges of strenuous, long-distance day hiking. It provides a group-trip environment in which hikers can build friendships by hiking with some of the same people on each trip. Two required hikes per month, a graduation hike in October, and a fun day of conservation work will take you from short, easy hikes to being able to participate in the easy and moderate level hikes that will get you out to the stunning vistas and trails that surround us. This Course is offered by our Seattle and Olympia branches and the course generally begins in late March/early April. Registration opens February 1! Thank you Megan for a beautifully written and very moving account of your experience in CHS. Brilliant. Inspiring and a great tribute to hike leaders and those who accompany them.